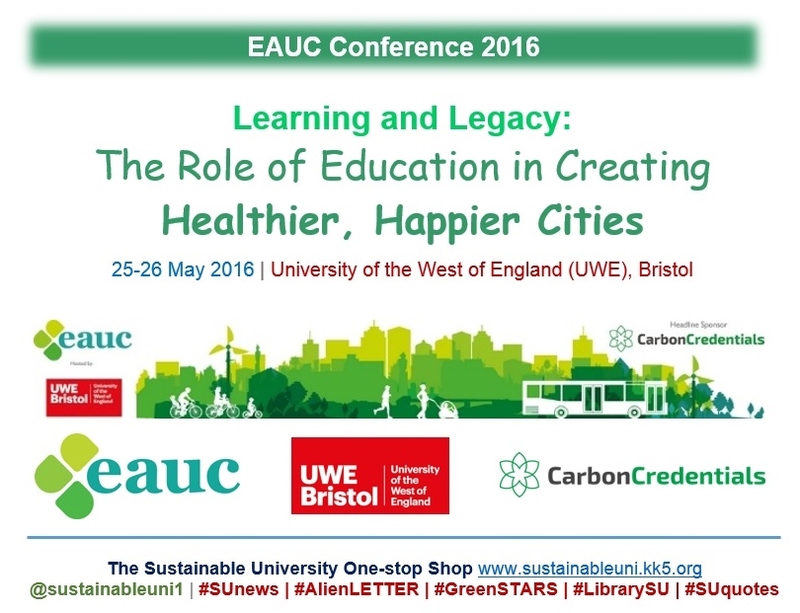 The 20th annual conference of The Environmental Association for Universities and Colleges (EAUC) will take place at the University of the West of England (UWE) in Bristol on 25-26 May 2016. Taking into account the global Sustainable Development Goals (SDGs) adopted by the UN General Assembly in September 2015, the conference focuses on one goal, namely SDG11, which calls upon countries to make cities more inclusive, safe, resilient and sustainable. The event will provide the delegates with an opportunity to explore the legacy of the host city Bristol’s European Green Capital Award 2015. Titled ‘Learning and Legacy: The Role of Education in Creating Healthier, Happier Cities,’ the conference will explore the important role that universities and colleges can play in encouraging community cohesion, connecting stakeholders, driving social and business innovation and acting as a catalyst for change for building sustainable cities. The conference will bring together delegates from the further and higher education sector, including those responsible for environmental management, estates and facilities, finance and procurement as well as curriculum leaders and students. It will comprise plenary sessions, interactive workshops, and facilitated networking events, a gala dinner and an exhibition. Keynote | A Challenging Journey: Driving Change for Tomorrow’s Leaders? The programme will also feature a number of case studies in the sessions and most of them are winners or highly commended entries in Green Gown Awards. In partnership with the National Union of Students (NUS), the conference will hold a number of workshops that will be particularly relevant to students and students’ union representatives. The event will also facilitate networking in a number of ways, including a pre-conference social the night before the main conference, an exhibition and a gala dinner. EAUC AGM 2016 will also be held during the conference. The EAUC is a not-for-profit charity with a membership of over 215 universities and colleges, supporting sustainability in the UK tertiary education sector. 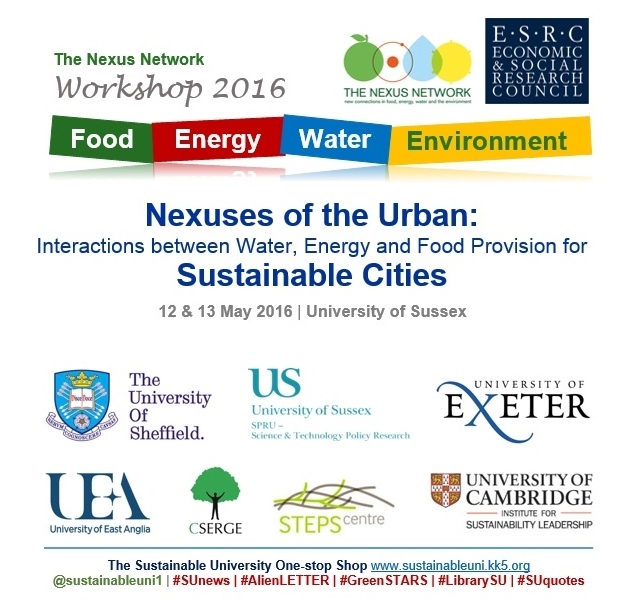 A Nexus workshop, titled ‘Nexuses of the Urban: Interactions between Water, Energy and Food Provision for Sustainable Cities’, will take place at the University of Sussex from 12 to 13 May 2016. Workshop participants will take stock of what kind of plural understandings of ‘urban nexuses’ are emerging, produced by (partnerships between) activists, communities, think tanks, corporations, and multilateral organizations, natural scientists, humanities scholars and social scientists. The workshop will particularly reflect on the contribution that different social science perspectives might make in understanding urban nexuses, and how social scientists might effectively participate in inter- and trans-disciplinary initiatives. Another aspect that will be considered is what kind of policy mechanisms and events might support the pursuit of the partnerships for developing new understandings. What divergent framings and understandings of ‘urban nexuses’ are emerging and why are they important, in what ways and to whom? What are the implications of these understandings and their foci for governance of nexus interactions by public, private and hybrid arrangements? What implications do these understandings hold for political-economic action by, and for alliances between, civil society organizations, businesses and social movements striving for sustainability and justice? What kind of relations (inter- and trans-disciplinary alliances, engagements with the material world) underpin the making of the emerging understandings of ‘urban nexuses’? What new inter- and trans-disciplinary approaches (and concepts) do we need to further understand interactions at ‘urban nexuses’, including the interdependent vulnerabilities associated with access to food, water and energy in cities? Led by Dr Saurabh Arora from Science Policy Research Unit (SPRU) at the University of Sussex, this event is supported by the core team of Nexus Network. Funded by the Economic and Social Research Council (ESRC), the Nexus Network is a three-year initiative to foster debate, innovative research and practical collaborations across the linked ‘nexus’ domains of food, energy, water and the environment. It brings together researchers, policy makers, business leaders and civil society to develop collaborative projects and improve decision making in these areas. Encourage debate, fund innovative research and improve decision making across the linked ‘nexus challenges’. Enable researchers and stakeholders to develop and share new methodologies, data, conceptual frameworks, skills and practices directed towards nexus challenges. Note: This post mainly consists of extracts from the conference page on the Nexus Network’s website. The logos in the graphic are from respective websites. 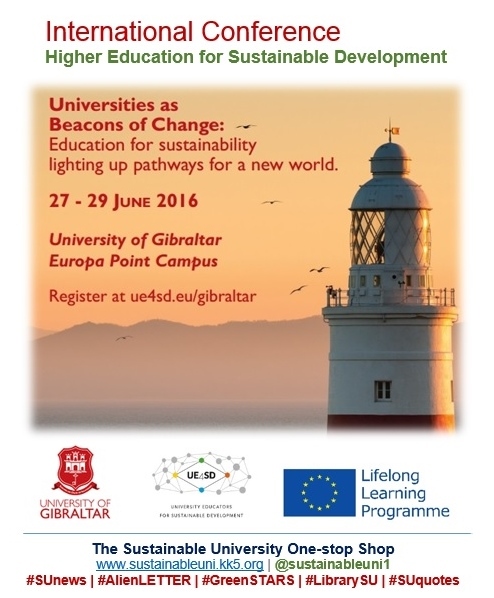 A three-day conference, titled ‘Universities as Beacons of Change: Education for Sustainability lighting up pathways for a new world,’ will take place at the University of Gibraltar, Gibraltar, UK, from 27 to 29 June 2016. How can universities become beacons of change and good practice in Education for Sustainable Development (ESD)? What type of teaching approaches and professional skills are needed to enable university educators to develop ESD in their own organisations? How can we support university educators to develop professional competences in ESD? What are the connections between ESD, professional development and quality enhancement in higher education? Its organizers/sponsors are the University of Gibraltar, the University Educators for Sustainable Development (UE4SD) project and EU’s Lifelong Learning Programme. Note: The photo part in the graphic is from the conference brochure.